The Wii balance board has long been in need for a useful addon, and this push-up bar is meant to deliver just that. Unfortunately, this set of bars are extremely vulnerable, being held in place using your weight alone and a couple of cheap foam strips acting as "grips" which essentially don't do much gripping at all. The design is sloppy and cheap looking and any significant pressure on the bar will result in it falling to pieces. 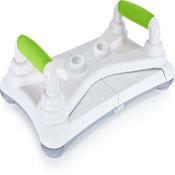 The bar fits onto your existing balance board and is compatible with Wii Fit and Wii Fit Plus. The $25 CTA Digital Wii Push Up Bar does, however, offer us the chance to look at the following video which is just about as cringe worthy as the product..